Typing in "Polydactyl" must mean you can only really be looking for Hemingway cats information. These are the most famous members of this group due to one thing only. The amount of toes that they have on their feet. At least that is what attracted me to research them, as a normal cat doesn’t really mean much to me. I have one myself, which is either sleeping or clears off through the cat flap each day, only to come back when it’s hungry. So on this page we will try to give you the best information to polydactyl cats as we can in regards to this strange phenomenon, detailing how they got there, why they have the extra digits, how many of them there are, and any other facts that come to mind as we pound down on our keyboard. So let’s start with the main thing……those extra toes! How Did Hemingway Cats Get Their Extra Toes Then? Like many things that deviate from the norm, it is down to genetics. The actual term for this disability is polydactyl cat, or another name that is in known by hyperdactyl. The cat is born with extra toes, and although we have mentioned six toes, they can actually have as many as 28 or 29. I’m not sure that any of the Hemingway cats has this many, but the world champ for furry deformity is a cat from Ontario in Canada, that got itself in the Guinness Book of Records for having a certified 27 toes. Although there are rumours that another cat owner from Main in America, has told Guinness that their cat has 28 toes, but this is yet to be confirmed as of time of writing. Now this is an interesting fact within a fact (yep you came here looking for information on just Hemingway Cats, and have ended up as experts! ), but if you look at the map of America both Ontario and Main are on the eastern side of their respective landmasses. Yep, I know that Ontario isn’t right over on the east, but its getting there. This is an interesting fact, as more polydactyl moggies, like the Hemingway cats are found on the east of the country than anywhere else. With the other biggest group are found on the west of England, which signifies that the cats most probably were brought between the two countries by boat. Passing the genetic deformity between them, as they travelled across the water. This would make sense as when it comes to the Hemingway cats, it is written down that Ernest himself took possession of his first multi digit cat from a Sea Captain that came into harbour down at the southernmost point in Key West as you will see further down the page. They Can’t Officially Be Known As Hemingway Cats Can They? No, this is of course the name given to the most famous residents of the Ernest Hemingway Home in Key West, so it’s only apt that they are given a name like this. But they are also called Mitten Kittens, which I think is a nice term and once again rather apt. One of the things that is also interesting is the owners of these cats, claim that they are more intelligent than normal cats because of the amount of toes they possess. That’s not true in any shape or form, but it is true that they have amazing dexterity and can do some incredible things with their extra toes, unlike normal cats. Some of the things that polydactyl cats have been known to do are the following and believe me they are not limited to these. How Did the Cats Get Into The Hemingway Home? Ernest was a great lover of cats. He liked their solitary and wandering nature, which he could understand, having the urge to disappear and wander the earth like he had for so many years. He also liked the way that they provided companionship for him, but didn’t overtly disturb him when the urge to write was strong, and he started his creative muse. But although he always had an interest in the furry felines, it wasn’t until 1935 when he got the first of the Hemingway cats into his possession, which was named Snowball. The cat was given to him as a gift from a sea captain that Ernest Hemingway had made friends briefly with, whilst the boat was docked in the harbour at Key West. It was not unusual for Captains to have cats on their boats, due to the mice problem that many boats suffered with, as they carried their valuable cargos across the waters. But a polydactyl cat was anything but normal and absolutely fascinated the famous writer, who was delighted when his temporally friend departed the shores, but left snowball behind to stay with him. Although not a sentimental man by nature Ernest certainly treasured the cats that had come into his life. So much so that he wasn’t content with placing a bowl of water on the floor, as you would see in cat lovers homes across the world. 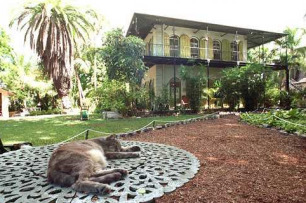 No the Hemingway Cats had their own special drinking fountain built on the grounds of the Hemingway Home. It was made from an imported Spanish olive jar from Cuba, whilst the base, that the jar sits on is in fact a male urinal removed from a bar and covered with tile. You can see the fountain today when you visit the home where Ernest Hemingway lived whilst in Key West, and is very popular amongst the thongs of tourists that join the tour each day. As you walk around on the tour you might be wondering about all the cats, and why they keep them around. When Ernest Hemingway died in 1961, he left it in his will that the animals had to be afforded protection and looked after on the property, therefore safeguarding their futures. So by law no one can touch them, and they can come and go as they like. But polydactyl cats, are exactly the same as a common cat, in regards to them not sticking to the law and wandering where they like. They come and go into neighbouring properties, and around the streets that surround the home. So in recent years the federal government have not been happy with this flagrant disregard of the laws, and have joined with the noisy complaints from the neighbours who feel that they are violating regulations concerning proper pet confinement. And so the cats although happily living where they are for years, are at risk of being moved on if no solution can be found to be the problem. Polydactyl or no polydactyl, it seems that you have to adhere to the laws like the rest of us. Paws mean laws I'm afraid!